^ Mairch 4 is the offeecial stairt o the first presidential term. Aprile 6 is when Congress coontit the votes o the Electoral College an certifee'd a preses. Aprile 30 is when Washington wis sworn in. 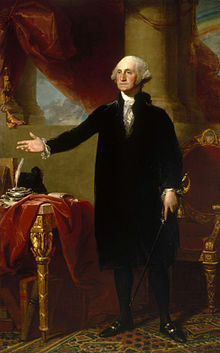 George Washington (22 Februar 1732 - 14 December 1799) wis ane o the Foondin Faithers o the Unitit States, servin as the commander-in-chief o the Continental Airmy durin the American Revolutionary War an later as the new republic's first Preses. He presidit ower the convention that draftit the Constitution. Washington, D.C., the caipital o the Unitit States, is namit for him, as is the State o Washington on the naition's Paceefic Coast. ↑ Chernow, Ron (October 18, 2010). Ron Chernow on George Washington (MP3). We The People Stories (Podcast). Philadelphia, Pa: National Constitution Center. Retrieved 2011-12-29. Wikimedia Commons haes media relatit tae George Washington. This page wis last eeditit on 11 Mairch 2018, at 00:35.